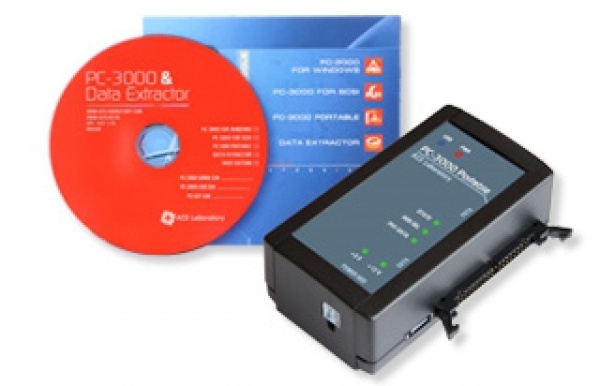 The PC-3000 Portable Professional System is the mobile hardware-software solution for diagnosing, repairing and recovering data from damaged HDDs based on SATA (Serial ATA) and ATA (IDE) interfaces for numerous vendors (Seagate, Western Digital, Fujitsu, Samsung, Maxtor, Quantum, IBM (HGST), HITACHI, TOSHIBA), for various capacities (from 500 MB to 6 TB) and various file systems FAT, exFAT, NTFS, HFS+, APFS, EXT2/3/4, XFS, ReiserFS, BtrFS, VMFS, UFS1/2, ZFS, DHF4.1, WFS0.x (for video recorders) and virtual machine images. The mobile PC-3000 Portable is the ideal data recovery solution for situations when you need to recover your customer's data on-site. It is a full-featured PC-3000 intended to work with laptops and can help you recover data when customer's data is too sensitive to be taken out of their office. Due to its mobility, the PC-3000 Portable Professional System is widely used in forensic labs. The PC-3000 Portable Professional System consists of the PC-3000 Portable hardware-software and the Data Extractor Portable software.